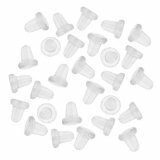 Beadaholique 144-Piece Clear Rubber Earring Backs – $1.28! Free shipping! Beadaholique 144-Piece Clear Rubber Earring Backs – $1.30! Free shipping!